Most unionists hesitate to take on Sinn Fein fully frontally, fearing demonisation by their numerous unscrupulous spinners and their army of social media abusers. After all, remember what happened to Arlene Foster last February when she declared that she would not yield on an Irish Language Act because, "if you feed a crocodile it will keep coming back and looking for more". She was referring to the Sinn Fein party, which is notorious for pocketing concessions ungraciously and then upping the ante. But within hours, the mighty republican rapid reaction force had insisted she was insulting all nationalists, thus cranking up the ethnic tensions that, in that and the subsequent election, continued the remorseless process of destroying the middle ground. Because it wants to be in government again, the DUP is circumspect about harshly criticising Sinn Fein, unlike Jim Allister, the only MLA of the tiny Traditional Unionist Voice party, which he set up when he split from the DUP over its decision to go into government with Sinn Fein. Allister is a criminal lawyer who recently explained that his opposition to an Irish Language Act is because Sinn Fein wants a "rights-based" act rather than "a needs-based approach" because it will give the opportunity for "an endless flow of legal challenges" which will cost the taxpayer a fortune. Their view of the exchequer as a magic money tree was exemplified by a target of Allister's, Catriona Ruane - best-known for her enthusiastic involvement in the Bring Them Home campaign which lobbied for the return of the "Colombia Three", Irishmen whose only crime was to train Marxist revolutionaries in methods of killing people. Subsequently, she was an unpleasant Minister for Education in Northern Ireland and from May 2016 a principal deputy speaker of the Assembly, which earned her �55,000 a year. Though she didn't stand in the last Assembly election, she kept her job, unlike the UUP's Danny Kennedy, who resigned as a deputy speaker when he lost his Assembly seat. It was only when Allister's exposure of this "scandalous situation" embarrassed Sinn Fein into saying it was nothing to do with them that she resigned. 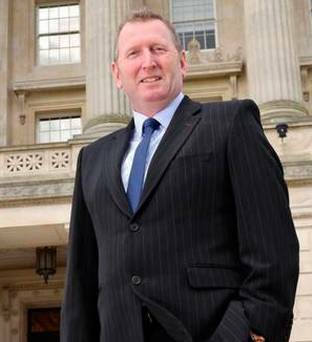 Enter the formidable Doug Beattie, a UUP MLA of exceptional physical and moral courage. During a 28-year army career, he served in Northern Ireland, Kosovo, Iraq and Afghanistan, where he earned a Military Cross. He later wrote An Ordinary Soldier, a book which impressed a vast readership because of his humility, honesty and compassion as well as his ability to tell a shocking story well: another memoir and a thriller have followed. A socially liberal unionist, who wants to vote according to his conscience, he became a UUP MLA last year, and has now come out with all guns blazing, accusing Sinn Fein of being "political scavengers and opportunists" who cynically hijack legitimate causes like the Irish language (which he thinks is "wonderful") and LGBT rights (which he supports) for party political ends. His first broadside pointed out such examples as Sinn Fein's blocking of a UUP attempt to remove the discriminatory requirement in Catholic state-sponsored schools for teachers to have a religious education certificate, its opposition to giving military veterans help available to ex-paramilitaries and its opposition to pursuing the murderers of Co Louth farmer Tom Oliver while demanding more and more investigations into the security forces' alleged wrong-doing. The party's "idea of equality is to eradicate Britishness while aggressively pursuing the republican agenda, which seeks to sanitise the terrorist campaign which sabotaged Northern Ireland for 30 years", and in order to promote the party on both sides of the Border, it is corrupting the campaign being run by "true, committed Irish language speakers and the LGBT community". His response to Sinn Fein's complaint was excoriating: "If Sinn Fein were upset by my words, let them be upset. I would much rather they were upset and offended by the execution of 10 innocent men at Kingsmill, the burning alive of 12 people at La Mon, the murder of innocent shoppers on the Shankill Road 24 years ago, the fact that the IRA butchered Paul Quinn - unfortunately the list of human rights abuse carried out by the IRA goes on and on. And all condoned or excused by Sinn Fein." He wouldn't take any "offended rhetoric from them. They have been pandered to far too long". The party operates "with a cold and callous heart" and in the 20 years since the Agreement has shown itself "incapable of generosity apart from gestures made by Martin McGuinness". Sinn Fein is an expert in passive aggression, avoiding insulting people directly but winding up unionists by holding events certain to infuriate them. A Sinn Fein tweet that the appalling MEP Martina Anderson, who served 13 years for her IRA exploits, was "to host a Brexit human rights conference in Belfast" was retweeted by Beattie with the suggestion she should start the conference "by saying sorry - sorry for burning you alive, sorry for abducting, torturing and murdering you, sorry for the devastation of a bombing campaign I was part of that targeted men, women and children". Articulate, intelligent, moderate and unafraid, Beattie is a new and formidable opponent of Sinn Fein hypocrisy and double standards. Their tweeters are doing their usual nasty work, but Beattie just doesn't give a damn.